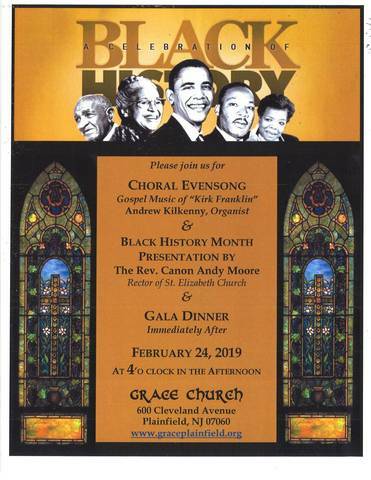 PLAINFIELD, NJ – Grace Episcopal Church in Plainfield will present a choral evensong and dinner to celebrate Black History Month. The Rev. Canon Andy Moore, Rector of St. Elizabeth Church, will give the presentation. Enjoy the Gospel Music of “Kirk Franklin” with Organist Andrew Kilkenny. The special event will be held on Sunday, Feb. 24 at 4 p.m. at 600 Cleveland Ave.
For more information, visit www.graceplainfield.org, or follow the Facebook event.